How Hitchcock "Directed" an Episode of Mr. Robot. From the 80s movie riffs in Stranger Things to the 90s sitcom metacomedy of Bojack Horseman, current television is mainlining a sophisticated form of nostalgia. These shows aren't just playing dress-up. At their best, they're a reflection on our history, our culture—pop and otherwise—pondering how we got here from there and what went wrong along the way. It's a complicated experience. Bojack is the first talking horse to move me to tears. Achingly wistful, Mr. Robot plays with nostalgia too. 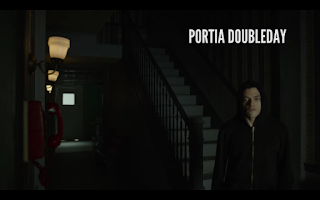 Season two, running now on the USA Channel, ups the ante with each episode crafted in the style of a different film director. The choices aren't arbitrary. The directorial aesthetics spring from the story itself, tapping the unique perspective of these great filmmakers to shine more light on the characters. It's as if showrunner Sam Esmail, who wrote and directed every episode(! ), is living out the fantasy of bringing Coppola, Hitchcock, Kubrick and others in to guest direct his show. Naturally, Hitchcock got the season premiere episode spot: the psychological espionage thriller genre owes so much to him. The episode is suffused with all sorts of Hitchcockian business. 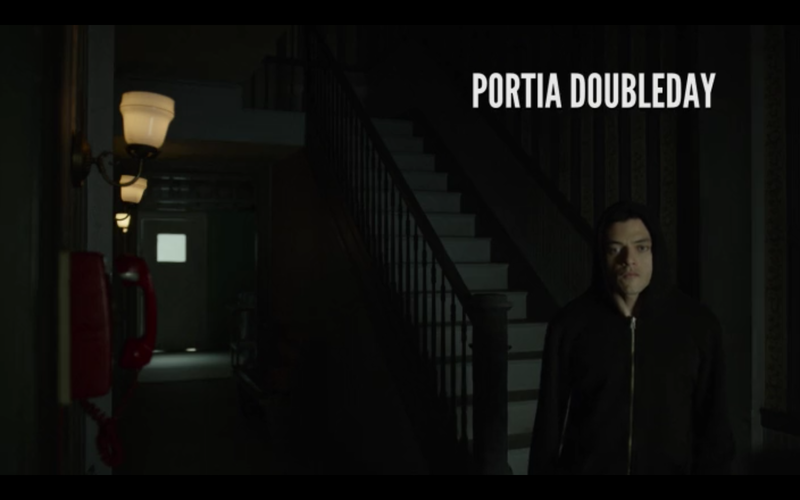 Since the end of season one, Elliott (Rami Malek) has moved back in with his stern, controlling mother with whom he's had a troubled relationship. As he explains to his therapist, it's "better to live with the devil you know than the one you don't." Hitchcock knew from mommy issues. Elliott's house and his as-yet unnamed mother, obviously inspired by Psycho, aren't just easter eggs planted for film fans' delight, they're an extension of the story itself. Without a word, the grave, interiors of his childhood home explain the barren architecture of Elliott's soul. 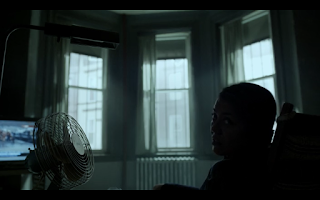 Take a look at these shots from the opening credits. 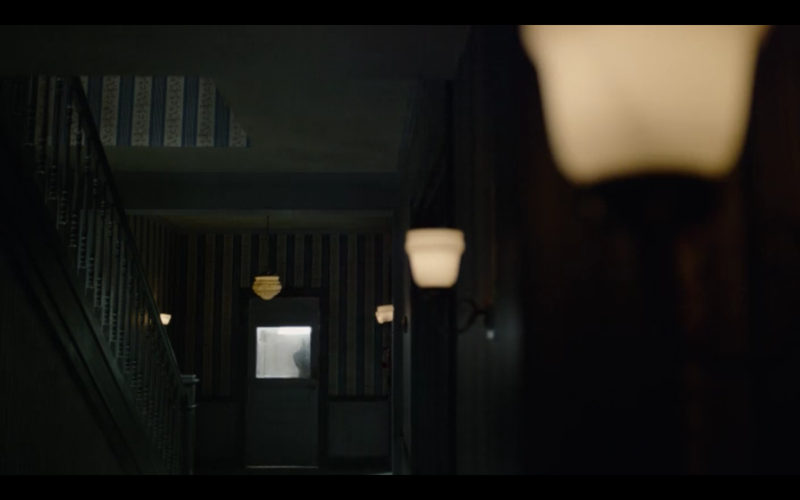 In this riff on the Bates mansion, the wall sconces pull the eye to the door, which seems to promise, not escape, but greater terrors outside. Although we're given a fairly detailed tour of the inside of the house, we don't even glimpse its exterior. 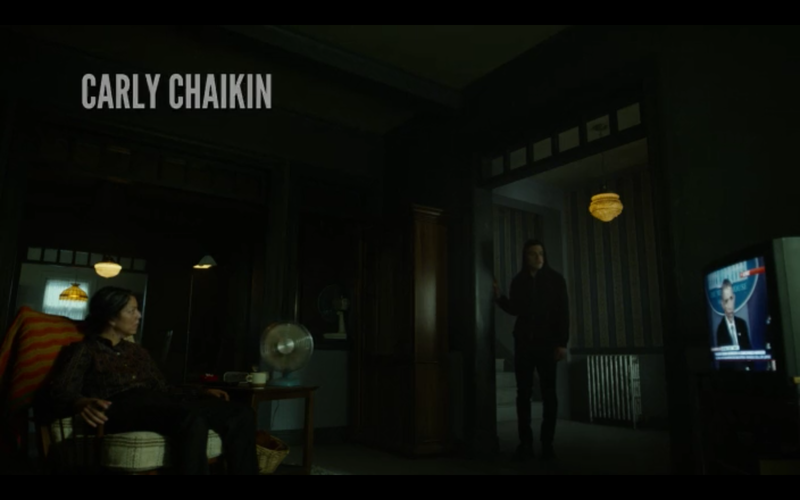 I'm guessing Esmail felt that a copy of the iconic façade of the Bates mansion would be going too far. But we do get a glimpse of his down-at-heels neighborhood, eclipsed by the modernity of an elevated train which is itself now a shabby relic. 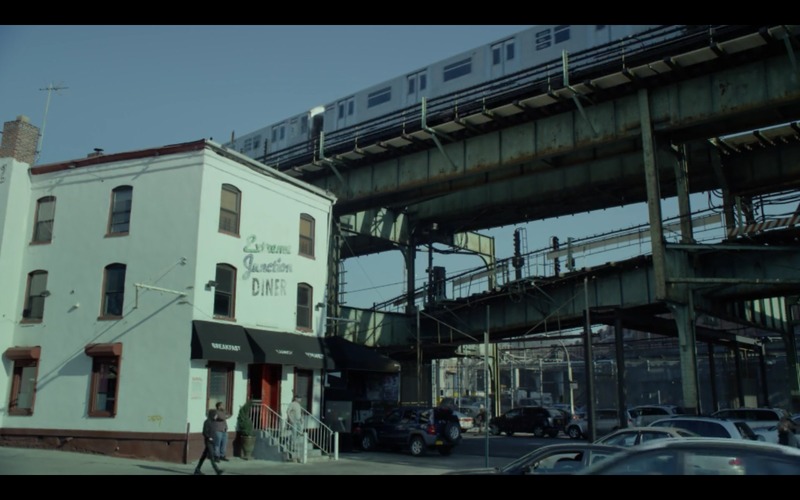 Although it does a better business than the Bates' enterprise, the Extreme Junction Diner (in real life, the Paphos Diner at 2501 Fulton Street in Brooklyn) has seen better days. Is the name a reference to extreme unction—last rites? One Redditor thinks so. The Bates Motel lost its stream of clientele when the Eisenhower-era superhighway was built, diverting traffic away. 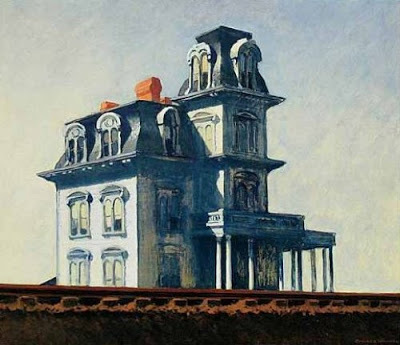 As I've written previously, the Bates mansion was modeled on Edward Hopper's 1925 painting House by the Railroad, which, like the Extreme Junction Diner, one day found itself on the wrong side of the tracks. It's pretty much impossible to set a violent event in a shower without hearkening back to Psycho. In a house-gone-berserk scene that also recalls Gaslight (not a Hitchcock film, though many assume it is), the Evil Corp attorney steps into a shower only to be assaulted by scalding-hot water (see also: Evil Dead and Pulse (1988)). Shot for shot, it's a Psycho moment. Norman Bates admitted it: "We all go a little crazy sometimes." 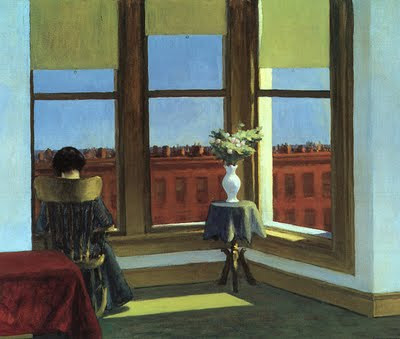 In his case, his long-dead mother would occasionally take over his mind, to the detriment of his female guests. Likewise, when Mr. Robot, Elliot's father (Christian Slater), takes over, the global economy does a faceplant. If there's one theme that dominates Mr. Robot, it's that one's past controls one's present. This, too, is one of of Hitchcock's greatest themes. You see it in Rebecca, Under Capricorn, Psycho, and many others. 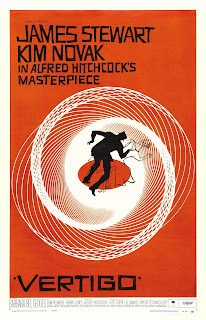 Its most poetic expression is in Vertigo, whose Scottie (James Stewart), is caught in the undertow of a woman with a seemingly ancient past and ends up driving around in circles seeking a truth that turns out to be a lie. Elliott's father sneeringly says, "Round and round we go, you not knowing what you did or didn't do. Our infinite loop of insanity." 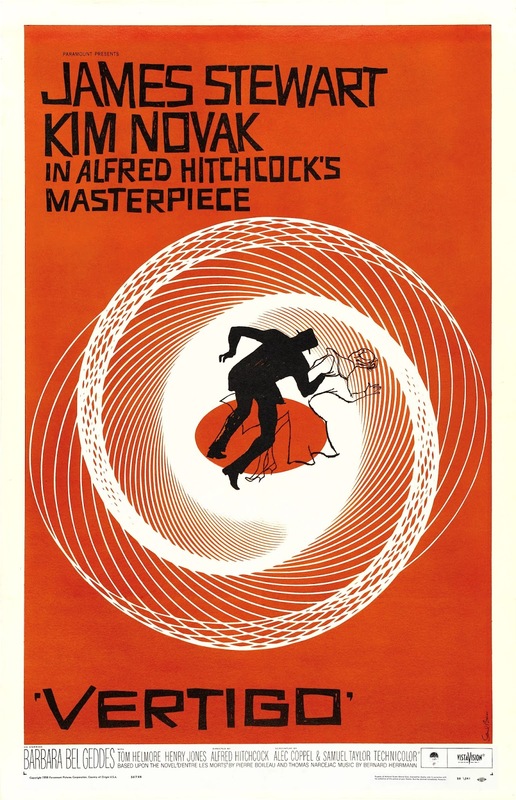 And then he drops a twisted apple peel on the floor, which strongly resembles the spiral in the Hitchcock film's iconic poster. 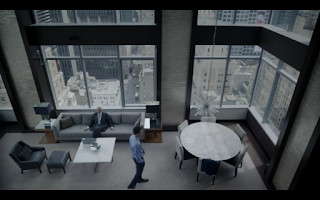 Alert viewer Christy LaGuardia also pointed out that the shooting angles and modern architecture of the C-suite high atop the Evil Corp tower resemble those of Van Damme's Frank Lloyd Wright-inspired mountain aerie in North by Northwest. 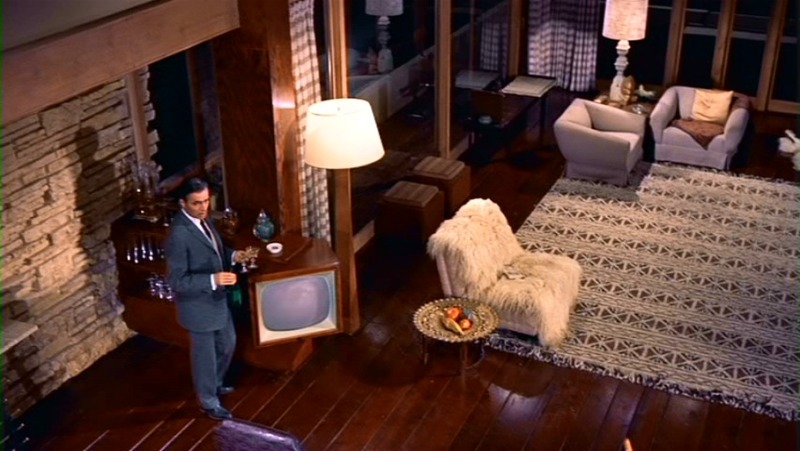 In this floor-level shot, I, no doubt like many other film nerds, freeze-framed the show at this point to make sure no cameras or crewman could be seen reflected in the chrome lampshade. (They can't.) 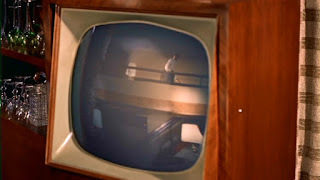 And I couldn't help wondering if it was a sort of nod-but-not-really to Van Damme's television, which aided the bad guys in the discovery of Roger Thornhill. 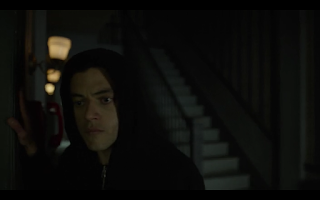 On the surface, this episode is about control. In a larger sense, it's about individual Will and whether such even exists. Elliott tries like hell to exorcise Mr. Robot from his mind and the pushback is fierce. Says the latter, "This control you think you have? It's an illusion." As Norman said, while dining on sandwiches with Marion Crane (Janet Leigh): "You know what I think? I think we're all in our private traps, clamped in them, and none of us can ever climb out. We scratch and claw... but only at the air, only at each other, and for all of it, we never budge an inch."